Select: Editorial 29 - Black is the new White for 12th. Editorial 28 - Matt Smith's finest episode Editorial 27 - Elisabeth Sladen dies Editorial 26 - SERIES 5 - The magic is returning Editorial 25 - The 11th actor pre-announcement Editorial 24 - THE NEXT DOCTOR comment Editorial 23 - Focus! Editorial 22 - Finally, an EARTHSHOCK moment! Editorial 21 - Winge! Winge! Winge! Editorial 20 - Tate stirs the mix Editorial 19 - Billie Piper returns to WHO Editorial 18 - Where's the Brigadier? Editorial 17 - Series format change - a good move? Editorial 16 - Agyeman unjustly hounded by fans? Editorial 15 - NEW SERIES spoilt by smug BBC WALES Editorial 14 - Smell the butter-coated Popcorn Editorial 13 - Last Editorial 12 - There's a problem with Time Travel Editorial 11 - David Tennant & Me Editorial 10 - SERIES 3 should move to September 2007 Editorial 9 - Camp critic Editorial 8 - Not wrong all the time! Editorial 7 - What's next? Editorial 6 - Questions too afraid to ask... Editorial 5 - Terrance Dicks - New Series needs you? Editorial 4 - David Tennant - What can he do? Editorial 3 - RTD and EOH Editorial 2 - New Series Editorial 1 - It's Eccleston! "...visually very smart...design is refreshingly original..."
"...other websites are justifiably scared of..."
. "...flawless from beginning to end; a very polished look..."
eyeofhorus.org.uk is an online DOCTOR WHO resource, celebrating and chronicling the BBC tv science fiction drama series - past and future. 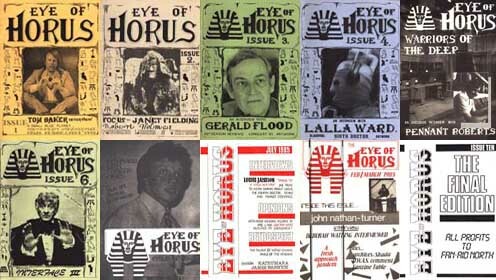 The original York-based printed fanzine, EYE OF HORUS (first published in 1983), returns just in time to both celebrate the 40th anniversary and the 2005 return of the seminal series. One of the original Editors and one of the magazine's contributors re-launched this online version in April 2003. The aim has not changed since the last issue in 1985: to continue to be a hybrid DOCTOR WHO resource - cast/crew interviews, articles, previews/reviews, and present valuable archive material from the original publication. The printed fanzine completed ten issues (with the final issue's profits being donated to DOCTOR WHO fandom's FANAID NORTH - the equivalent of BAND AID) and was one of the first UK fanzines to be exported to the USA. Interviewees for EOH included Tom Baker, Lalla Ward, Frazer Hines, John Nathan-Turner, Tony Burrough (Designer), Gerald Flood, Deborah Watling and Louise Jameson. And why EYE OF HORUS? Its relation to DOCTOR WHO? DOCTOR WHO, the DOCTOR WHO logo and TARDIS Copyright © BBC 2013. The Dalek word and image Copyright © Terry Nation 1963. No infringement upon this Copyright or other official BBC DOCTOR WHO Licence Holder Copyright is either implied or intended. However, eyeofhorus.org.uk would welcome content syndication, if wish to reproduce content (text, non-copyrighted images or graphics), contact the eyeofhorus.org.uk Site Editor using the EDITORIAL EMAIL link below.